Greater Lunnon is the top-level admeenistrative diveesion o Ingland coverin Lunnon. It wis creatit in 1965 an spans the Ceety o Lunnon, includin Middle Temple an Inner Temple, an the 32 Lunnon boroughs. This territory is coterminate wi the Lunnon Govrenment Office Region an the Lunnon European Parliament constituency. The region haes bi far the heichest GDP per caipita in the Unitit Kinrick. It covers 1572 km2 (607 square miles) an haed a 2009 mid-year estimatit population o 7,753,600. The term Greater Lunnon wis in uise afore 1965 tae refer tae a variously defined aurie, lairger than the Coonty o Lunnon an aften similar tae the Metropolitan Police District. In addition tae its admeenistrative an statistical functions, Greater Lunnon (excludin the Ceety o Lunnon) is ane o the 48 ceremonial coonties o Ingland, an is unner the Greater Lunnon Lieutenancy. Insteid o formin a single poleetical unit, Lunnon is dividit intae the sma, interior Ceety o London an the hinter wider Greater Lunnon. This arrangement haes come about acause as the aurie o Lunnon grew an absorbed neighbourin settlements, a series o admeenistrative reforms did no fully amalgamate the Ceety o Lunnon wi the metropolitan aurie, an its unique poleetical structur wis retained. Ootside the limited bundaries o the auld ceety, a variety o arrangements govrened the wider aurie syne 1855, culminatin wi the creation o the Greater Lunnon admeenistrative aurie in 1965. The term Greater Lunnon haed been uised well afore 1965, particularly tae refer tae the aurie covered bi the Metropolitan Police District (such as in the 1901 census), the aurie o the Metropolitan Water Board (favoured bi the Lunnon Coonty Cooncil for statistics), the Lunnon Passenger Transport Aurie an the aurie defined bi the Registrar General as the Greater Lunnon Conurbation. The Greater Lunnon Arterial Road Programme wis devised atween 1913 an 1916. Ane o the lairger early forms wis the Greater Lunnon Planning Region, devised in 1927, which occupee'd 1,856 square miles (4,810 km2) an included 9 million fowk. It wis historically kent as Inglon. Although the London County Council haed been creatit as a London-wide authority coverin the Coonty o Lunnon in 1889, the Coonty did no even cover aw the built-up aurie o Lunnon then, pairticularly Wast Ham an East Ham; furthermair mony o the LCC hoosin projects, includin the vast Becontree Estate, wur constructit ootside its formal bundaries. London County Cooncil pressed for an alteration in its bundaries soon efter the end o the First Warld War, notin that athin the Metropolitan an Ceety Police Districts there wur 122 hoosin authorities. A Ryal Commission on Lunnon Govrenment wis set up tae consider the issue. London County Council proposed a vast new Greater Lunnon, somewhaur atween the Metropolitan Police District an the entire Hame Coonties. Protests wur made at the possibility o includin Windsor, Slough an Eton in the authority. The Commission made its report in 1923, rejectin the LCC's scheme. Twa minority reports favoured chynge ayont the amalgamation o smawer urban destricts, includin baith smawer borough cooncils an a Central Authority for strategic functions. The Lunnon Traffic Act 1924 wis a result o the Commission. Reform o the local govrenment arrangements in the Coonty o Lunnon an its environs wis again considered bi the Ryal Commission on Local Govrenment in Greater London. Greater Lunnon wis formally creatit bi the Lunnon Govrenment Act 1963, which teuk force on 1 Aprile 1965, replacin the umwhile admeenistrative coonties o Middlesex an Lunnon, addin the Ceety o Lunnon, which wis no unner the London County Council, an absorbin pairts o Kent, Surrey, Essex an Hertfordshire. Greater Lunnon oreeginally haed a twa-tier seestem o local govrenment, wi the Greater London Council (GLC) sharin pouer wi the City of London Corporation (govrenin the sma Ceety o Lunnon) an the 32 Lunnon borough cooncils. 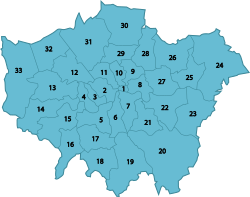 The Greater London Council wis abolished in 1986 bi the Local Govrenment Act 1985. Its functions wur devolved tae the Corporation an the Lunnon boroughs wi some functions transferred tae central govrenment an joint boards. Greater Lunnon wis uised tae form the Lunnon region o Ingland in 1994. A referendum held in 1998, established public will to create a regional authority. The Greater London Authority, London Assembly and the directly elected Mayor of London were created in 2000 by the Greater London Authority Act 1999. The 2000 an 2004 mayoral elections wur baith wan bi Ken Livingstone, who haed been the feenal leader o the GLC. The 2008 election wis wan bi Boris Johnson the Conservative Pairty candidate. In 2000 the ooter bundary o the Metropolitan Police District wis re-aligned tae the Greater Lunnon bundary. Greater Lunnon is bundit bi the hame coonties o Essex an Hertfordshire in the East o Ingland region an Buckinghamshire, Berkshire, Surrey an Kent in Sooth East Ingland. The heichest point in Greater Lunnon is Westerham Heights, in the North Douns an on the bundary wi Kent, at 245 metres (804 ft). The aurie o Greater Lunnon haes no chynged significantly syne its creation. There hae been a considerable number o smaw bundary chynges. The maist significant o these wur the 1969 transfers o Knockholt tae Kent an Farleigh tae Surrey an a series o minor adjustments durin the 1990s which realigned the bundary tae the M25 motorwey in some places. The majority o Greater Lunnon forms the London low emission zone frae 4 Februar 2008. Greater Lunnon is no a ceety in the proper sense that the wird applies in the Unitit Kinrick, that o being a status grantit bi the Croun. In addition, ane o the Lunnon burghs, Westminster, is awready a ceety, as well as the Ceety o Lunnon itsel which would make such a status anomalous. Despite this, Greater Lunnon is commonly regardit as a ceety in the general sense o a municipality. A Laird Lieutenant o Greater Lunnon is appointit for its aurie, less the Ceety o Lunnon, an area identical tae the Metropolitan Police District, and for the purposes o the Lieutenancies Act 1997, this aurie is defined as a coonty. The term "Lunnon" is normally uised in reference tae Greater Lunnon or tae the owera conurbation, but no aften tae the auncient, tiny Ceety o Lunnon. Insteid, this sma aurie is aften referred tae simply as "the Ceety" or "the Square Mile" an it forms the main financial destrict. Airchaically the urbanised aurie o Lunnon wis kent as the Metropolis. In common uisage, the terms "Lunnon" an "Greater Lunnon" are uisually uised interchyngeably. It is offeecially dividit for some purposes, wi varyin definitions, intae Inner Lunnon an Ooter Lunnon. For strategic plannin purposes the region is dividit intae five sub regions. Greater London is under the strategic local governance of the Greater London Authority. The Greater Lunnon Authority (GLA) comprises an electit assembly cried the Lunnon Assembly an an executive heid kent as the Mayor o Lunnon. Greater Lunnon is dividit intae 32 Lunnon burghs, each govrened bi a Lunnon burgh cooncil; an the Ceety o Lunnon, which haes a unique govrenment datin back tae the 12t century. Aw Lunnon borough cooncils belang tae the Lunnon Cooncils association. Twa Lunnon burghs, Kensington and Chelsea, an Kingston, carry the purely honorific title o Ryal burgh. Athin the Ceety o Lunnon bundary are the liberties o Middle Temple an Inner Temple. For elections tae the Lunnon Assembly, Lunnon is dividit intae fowerteen constituencies. The constituencies are formed frae the aurie o twa or three boroughs combined. The Ceety o Lunnon forms pairt o the Ceety an East constituency. London is dividit intae 73 Parliamentary constituencies, which are aw sma borough constituencies. They are formed frae the combined aurie o several wards frae ane or mair Lunnon Boroughs. Typically a single borough is covered bi twa or three constituencies. This is a chairt o trend o regional gross value addit (GVA) o Inner Lunnon at current basic prices published (pp. 240–253) bi Office for National Statistics wi figures in millions o Breetish Punds Sterlin. This is a chairt o trend o regional gross value addit o Ooter Lunnon at current basic prices published (pp. 240–253) bi Office for National Statistics wi figures in millions o Breetish Punds Sterlin. The Greater Lunnon Authority haes twin an sister ceety agreements wi the follaein ceeties. For Burgh twinnin see Leet o twin touns an sister ceeties in the Unitit Kinrick#Lunnon. This page wis last eeditit on 16 Juin 2016, at 23:25.